I purchased this not really knowing what I was going to receive. The online seller thought it was an ambrotype, but couldn't be positive. 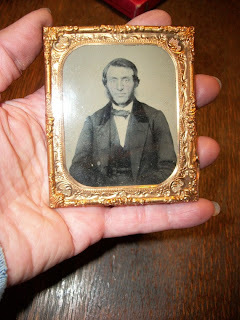 Because of the flat surface and the glass back, I assumed it was an ambrotype as well. It's actually a ruby ambrotype of a man. It's in very nice condition for its age.